HP E4210 Switch Series are entry-level 10/100 Ethernet LAN switches with enterprise-class quality of service (QoS), security, and management features, delivering high value for network administrators looking for an economical edge device. Available Power over Ethernet (PoE) models are ideal for Voice over IP and wireless networking installations, while non-PoE models are also available for simple port expansion. Dual-personality ports allow flexibility, setting them apart from lower-end devices. The series supports an industry-standard command-line interface, Web-based administration, and SNMP management. Switches can be clustered in any combination up to 255 units for simplified administration. 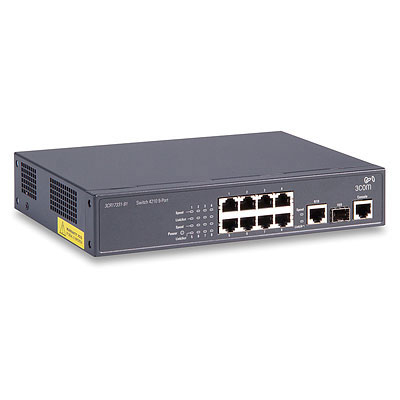 In addition to rack-mount models, HP E4210 switches are available in small form factor units for enterprise branch and small workgroup deployments, in both PoE and non-PoE versions, with the same manageability as the larger rack-mount models.